Universal Range Infinite Switch. 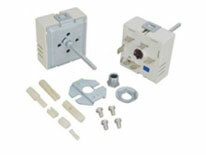 Includes several adapters to fit almost any configuration. Can be used with both 6″ and 8″ surface elements. Replaces Electrolux 5303935086, General Electric WB21X5243, and Whirlpool 4391989 700855K W10116762 Y700009 70009 700855 7-0009 7-0855. Fits many Whirlpool, Sears Kenmore, Kitchen Aid, Roper, GE, and several other brands. We ship across the continental US.